What is a Disc Golfer? Disc golf has become a huge part of many peoples’ lives, and will continue to do so as the years progress- but what does this mean? Many of us closely identify ourselves with the sport, maybe writing about disc golf in our social media bios, or talking about our incredible putts at work. Do these things make you a disc golfer? Like everything in life, the question of how to classify somebody is not as simple or binary as “yes, you’re a real disc golfer because you’ve collected over a thousand discs” or “no, I’m sorry, you are not a true disc golfer because you didn’t buy the new DGWT DUDE hoodie”. Most likely this kind of conversation concerning being a disc golfer will never end with a simple definition. As the snow melts around the country, and the days get longer, you might be so fortunate as to find yourself on the course more often. Whether you took some time off during the winter months, or you managed to keep your driving distance up all season (props to you! ), hopefully you had a chance to reflect on 2015, and thought about what you wanted to do in 2016. I know I did, and right on top of my goals for the year is “give my good friend Dylan a run for his money at the Trilogy Challenge this year.” (On a side note, who else is super excited for the new Trilogy Challenge discs: the Falchion, Marshal, and Sling?) Whether your aspirations for the year included disc golf or not, you probably did get the chance to think about things you wanted to do. What do your plans or other commitments say about you though? My personal goals range from disc golf to a biology research project. In this community we have a huge variety of people, from vastly different walks of life. We are fathers, mothers, daughters, brothers, and grandparents. We are accountants, web developers, machinists, drifters, and potters. It is this variety that ultimately defines the sport, at least for me. I don’t think of the group as a bunch of disc golfers, but rather, a huge ecosystem of diverse and amazing people who all enjoy throwing plastic and rubber at metal baskets. Again, these are just my thoughts concerning this topic. What really makes it a conversation is the sharing of thoughts. Asking others involved in the sport about what they thought it meant to be a disc golfer wrought responses like “one word: friendships” from twitter user @TheWiffle24 and “camaraderie amongst generations” from Robert Lair. Please let us know what you think it means to be a disc golfer, so that we can keep growing the discussion. Thank you for being you, it really is our diverse set of perspectives that makes this sport so awesome to be a part of. 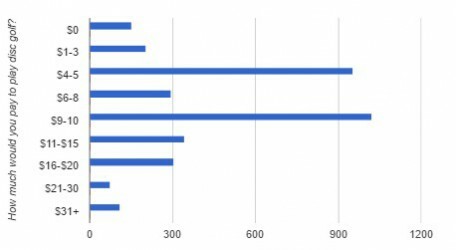 While our monkeys are crunching away to bring you more 2016 State of Disc Golf Survey results, I slipped away to show you guys some fun data. In a recent giveaway over on our Facebook Page, we asked people to enter by commenting ONE word that described their Disc Golf Game. 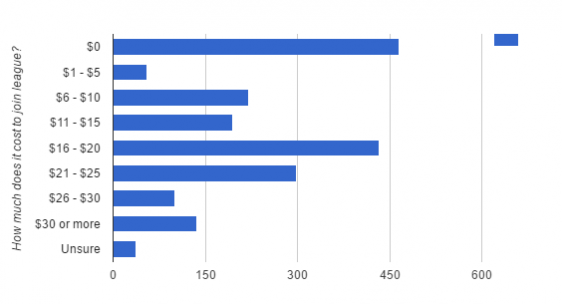 We had 330 responses with a wide variety of answers. 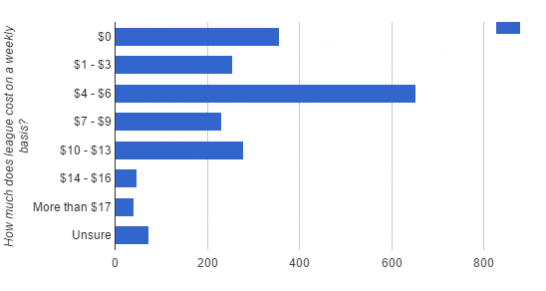 I enjoyed reading those comments so much that I put together a little chart to show you the top 10 most used words in the Facebook comments, plus some fun runner ups. 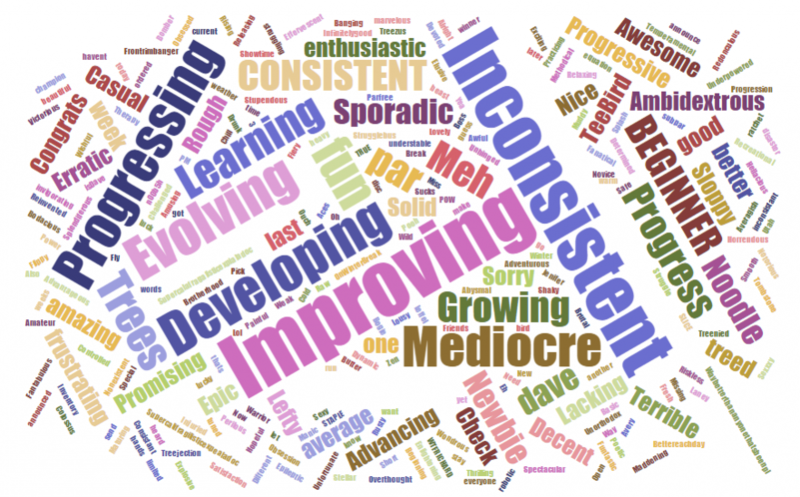 The number one most used word was “Improving”, which I love to see! I feel the same way about my game and it’s great to see other people succeed. However, I think a lot of us can relate to the second most used word, “Inconsistent”. My guess is that we can all relate to each of these words at some point during our game. It was also interesting to see the balance of Positive vs. 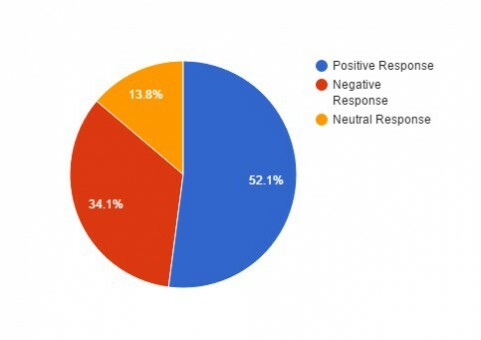 Negative responses. I realize that spur-of-the-moment words used to enter a giveaway aren’t the best data points that can be gathered, as some people may put certain answers just to be funny or unique. 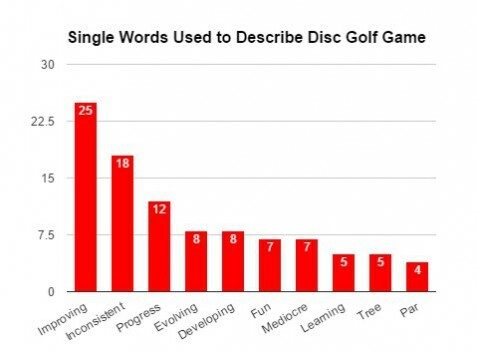 But perhaps this will give us a little insight to what people think about their Disc Golf game in general. I was glad to see that most people view their game in positive light, especially when thinking of a quick word to use. I myself might have been caught up in the “Treenied” or the “Strugglebus” category, but luckily I didn’t have to answer for myself. We do know from our friends over at Zen Disc Golf that being positive is key! Let’s just remember that everybody who answered this Giveaway question was trying to win a free disc, so obviously they love the game and want to play more. Well that wraps up today’s word-stats! Hope you enjoyed reading this very important article! Now get out there and tear it up on the course! Be sure to follow us on Facebook, Twitter, Instagram, Pinterest, Tumblr, Google+, and now SNAPCHAT to be up to date on exclusive Giveaways and Discount Codes! Our username on all platforms is InfiniteDiscs.